Rembrandt van Rijn (Dutch, 1606-1669), Self Portrait at the Age of 34, 1640. Oil on canvas, 102 x 80 cm © The National Gallery, London. PASADENA, CA.- The Norton Simon Museum presents an installation of Rembrandt’s striking Self-Portrait from 1640, on loan from The National Gallery, London this winter season. Titled Self Portrait at the Age of 34, the painting captures the image of the artist in his middle age: affluent, self-confident and wise. Its installation at the Norton Simon Museum marks the first time the painting has been on view in the U.S. and is part of a loan exchange program between the Norton Simon Museum and the National Gallery that began earlier this year, with the London installation of the Museum’s The Repentant Magdalene, after 1660, by Guido Cagnacci. Self Portrait at the Age of 34 has been installed in the Museum’s 17th-century art galleries, alongside the Simon’s own collection of Rembrandt paintings: Portrait of a Bearded Man in a Wide-Brimmed Hat from 1633, Portrait of a Boy, ca. 1655–60, and the artist’s Self-Portrait, ca. 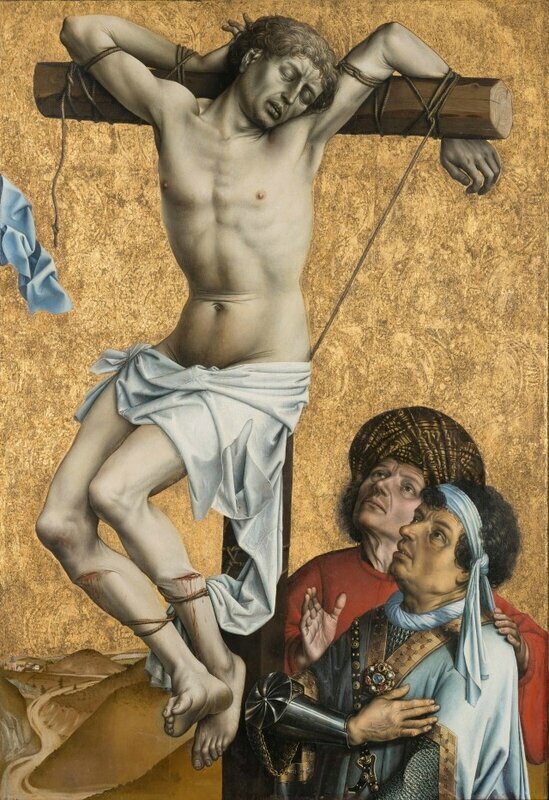 1636–38, executed only a few years earlier than the National Gallery’s. The painting is on view from Dec. 8, 2017, through March 5, 2018. 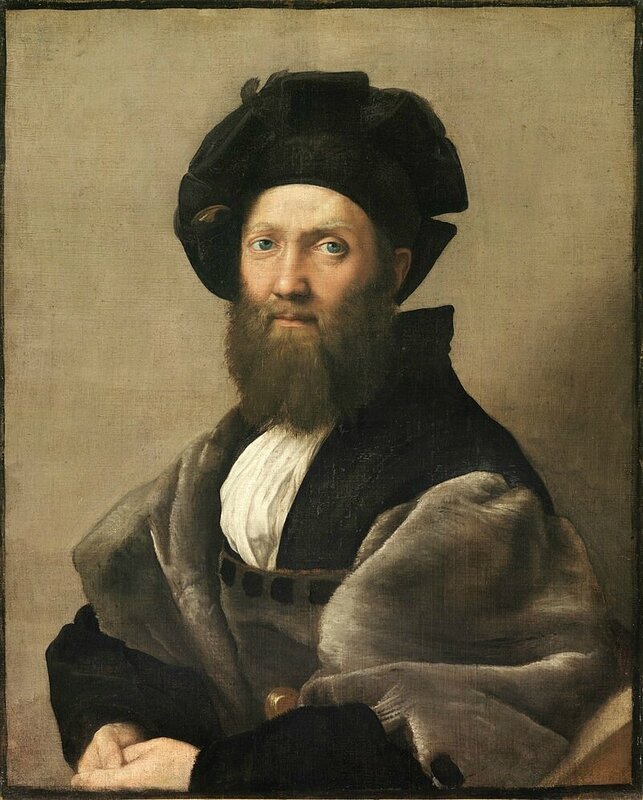 The presence of Raphael’s stunning 1515 Portrait of Baldassare Castiglione (now at the Louvre) in the April 1639 sale of property owned by the wealthy Flemish merchant Lucas van Uffelen was certainly not the first instance of a work by an Italian master in the Netherlands. Rembrandt himself came to own artworks attributed to Jacopo Bassano, Annibale Carracci, Giorgione, Michelangelo, Palma Vecchio and Raphael. 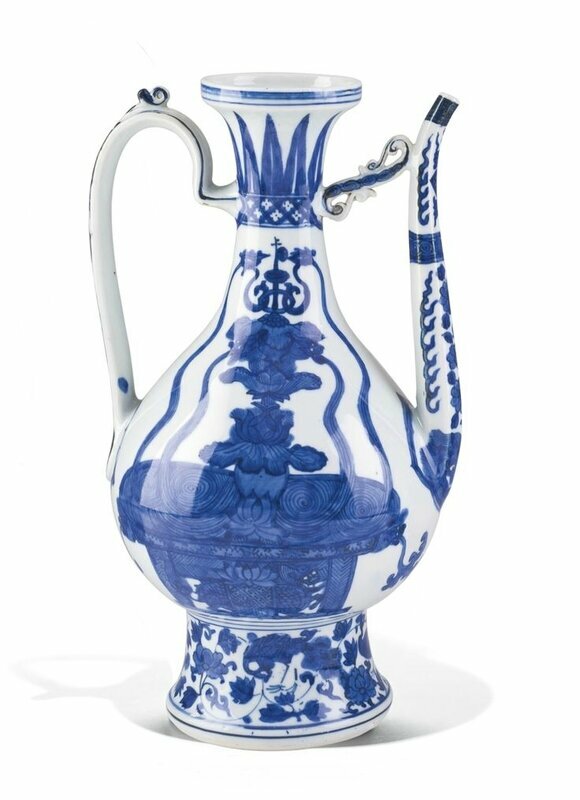 But the Van Uffelen sale is notable as being one of the most well-attended auctions in the first half of the 17th century, drawing locals and foreigners alike to bid exceptionally high prices for the high-quality contents of the auction. 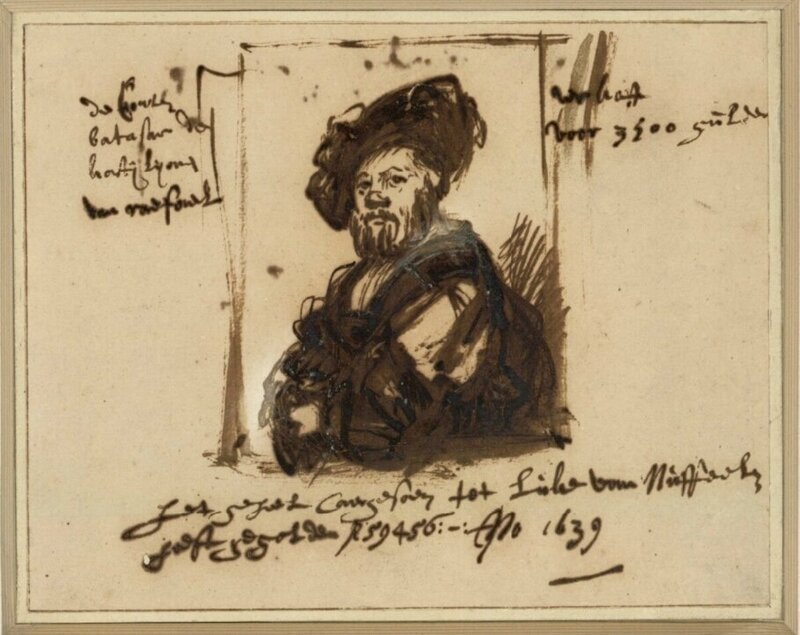 We assume that it was on this occasion that Rembrandt made his now-famous sketch of Raphael’s Portrait of Baldassare Castiglione that was on the auction block, annotating his drawing with not only the record price at which the painting was eventually sold (3,500 guilders), but also the enormous sum for the total proceeds of the estate sale (59,456 guilders). By this date, the highest figure paid to Rembrandt for one of his single-figure pictures was about 600 guilders, so witnessing the sale of a 125-year-old painting by one of the most treasured Italian Renaissance artists must have made an impression on the already-successful 33-year-old. His attention to this sale, and the Raphael portrait in it, is one of several instances that show that he was looking back to classical roots and seeking out the successful formulas of his predecessors. Raphael, Portrait of Baldassare Castiglione (1478–1529), 1515. Oil on canvas, 82 x 67 cm. © Musée du Louvre / Angèle Dequier. Rembrandt Harmensz. van Rijn (Leiden 1606 - 1669 Amsterdam), Drawing after the portrait of Baldassare Castiglione by Raphael, 1639. Pen in brown, white cover color, 16.3 x 20.7 cm © Albertina, Vienna. 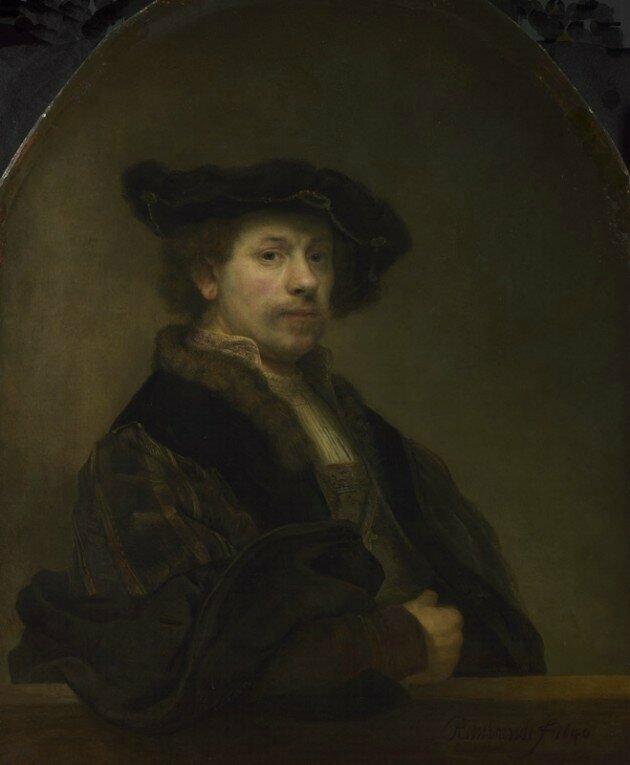 During its residency at the Norton Simon Museum, Self Portrait at the Age of 34 is being viewed from the vantage point of Rembrandt’s works executed between 1630 and 1640 from the Simon collection. Hanging alongside earlier and later examples of Rembrandt’s paintings, as well as a number of his students’ works, the breadth of the artist’s painterly technique even within this decade can be examined. Such is the case of the Portrait of a Bearded Man in a Wide-Brimmed Hat from 1633, now thought to depict Pieter Sijen (1592–1652), a wealthy Mennonite merchant. This is a pure portrait, not a tronie (or anonymous figure/type), but one depicting the stark, undecorated rigors of this religious group. The bearded man’s kindly stare and regard for the artist/viewer is consistent with Rembrandt’s other male portraits of the period, most of them directly addressing the viewer and revealing the depth of the sitter’s personality. 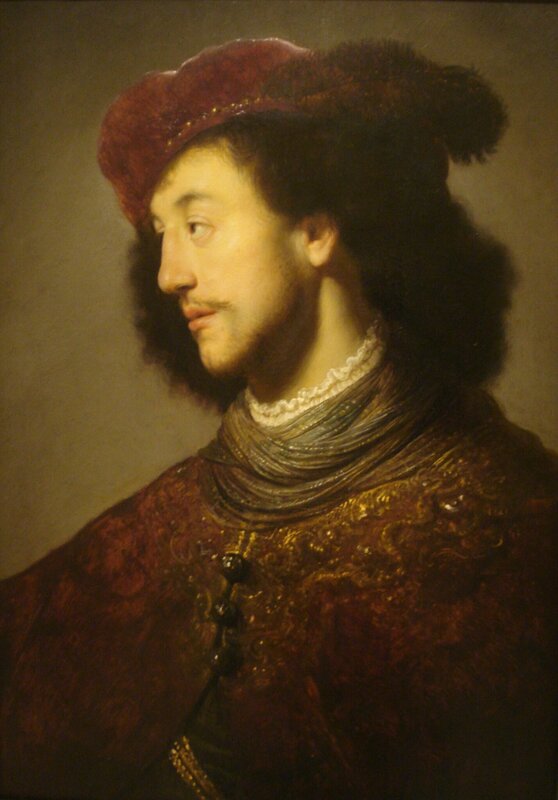 Compare this with the Simon’s tronie by Jan Lievens, Rembrandt’s studio partner in Leiden: Young Man with Red Beret, ca. 1629–1630, is a character study that is magical and mysterious, underscored by the feather and the exotic, diaphanous shawl draped over his shoulders. But the Lievens is clearly not meant to be a pure portrait and is set apart from the mature, soul-searching meditations that Rembrandt produces in the later 1630s. 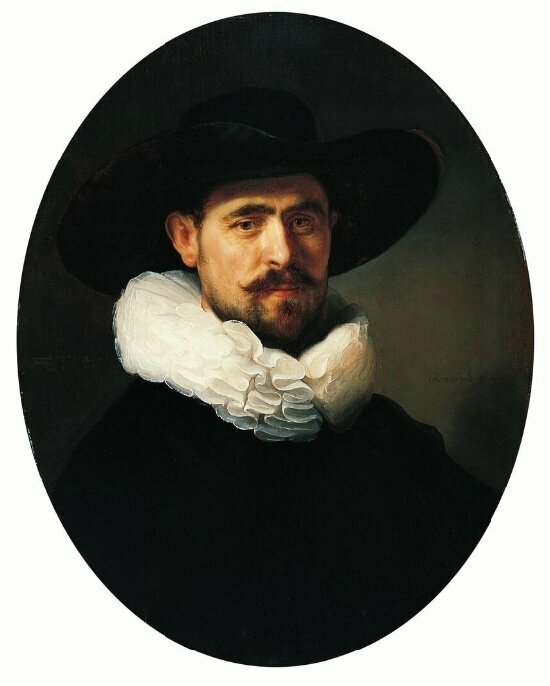 Rembrandt van Rijn (Dutch, 1606-1669), Portrait of a Bearded Man in a Wide-Brimmed Hat, 1633. Oil on panel, 69.9 x 54.6 cm, Norton Simon Art Foundation © Norton Simon Art Foundation. Jan Lievens (Dutch, 1607-1674), Young Man with Red Beret, ca. 1629–1630. Oil on panel, 69.9 x 53.3 cm, Norton Simon Art Foundation © Norton Simon Art Foundation.